A group of Washington D.C. high school students participated in a service project to collect and distribute coats to people who needed them. What I love is that these amazing kids did more than distribute coats. The high schoolers wrote encouraging notes and put them inside the pockets as a surprise for recipients. Those notes made people smile and feel special – that was as important as handing out the coats. Josh Kennedy-Noce and D’Mani Harrison-Porter were two of the teenagers running this project. How they got started goes back to the summer Josh and D’Mani attended Wave Week, a leadership camp for kids who participate in community service. After attending Wave Week, these guys decided that their high school needed a community service club. They didn’t complain there wasn’t a club. They didn’t ask other people to start one. They didn’t wait for someone else to start one. They simply founded their own. 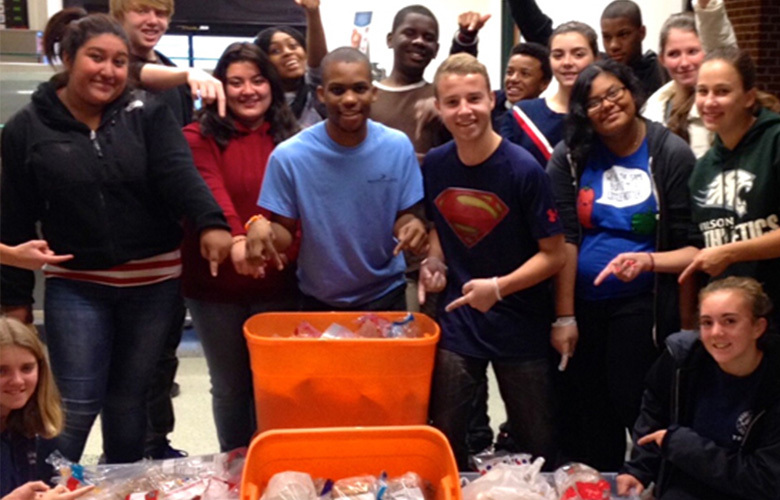 One of the club’s regular activities is “sandwich days,” in which students gather after school to make peanut butter and jelly sandwiches for homeless people. They have made thousands of sandwiches over the past year. Josh and D’Mani are smart marketers. They got approval to setup their activities in the school’s atrium; students walking by would ask what the club was doing and would often choose to get involved. In fact, classmates donated all of the sandwich ingredients. Josh and D’Mani got over 250 of their fellow students to participate as sandwich makers or donors. Josh (in the Super Man shirt) and D’Mani (next to him in light blue), led their school club in feeding thousands of homeless people. The club also participated in multiple “days of service” during the school year, which ranged from activities supporting a human trafficking nonprofit to helping out at a food bank to running a Halloween haunted house for local kids and more. As if all that weren’t enough, the club started a prom dress drive – they collected dresses and had an online closet with photos and sizing so girls from the school could anonymously pick a dress and have one to wear to prom. Like the notes in the coat pockets, the anonymous part of the dress picking was a small detail, but an important one. Not surprising, coming from these guys. My wife and I discovered the Wave Week camp that inspired Josh and D’Mani about 13 years ago when we took Richard, a then 15-year-old we mentored, to camp. We were young and had no kids, so we had no idea that you don’t take a kid to camp with four cases of candy to “share with his new friends.” Live and learn and our apologies to the counselors in Richie’s bunk and the parents of Richie’s bunkmates. Anyway, the camp is for kids who are passionate about service. It teaches leadership skills, so the students can have a bigger impact in their communities. The camp changed Richie’s life. So much so, that he has been a volunteer with the camp since the summer he attended, and Richie and I are both board members. Spark the Wave is much more than Wave Week camp. It provides a structure and support for amazing kids who are passionate about service. It’s similar to the structure that’s out there for kids who are athletes . . .
Two years ago my wife and I signed Jack, our then 3-year-old, up for T-Ball. (At pretty much any age after 4, kids can join all sorts of recreational sports leagues.) If Jack decides playing the sport is as interesting as picking flowers in the field and end of game snack time, he can choose to join his middle school and high school sports teams. If we want, we can get him private coaches or send him to camps that specialize in particular sports. Heck we can even send Jack to camps for specific sports’ positions. Here’s what Spark the Wave does that’s similar. 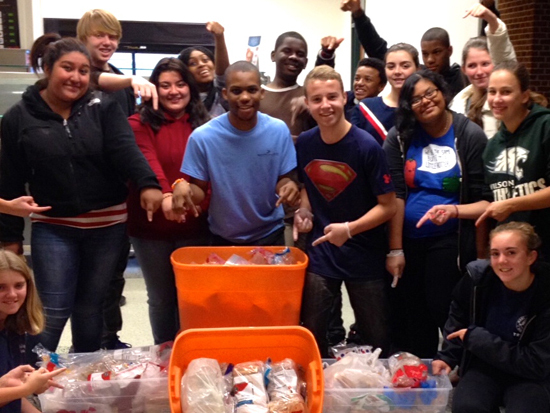 We support student led high school service clubs. High schools can’t afford to fund community service clubs, so many schools don’t even have them. Yet, these clubs are vital to exposing teens to service. We have dozens of kids at schools asking us to help them get their service clubs running, and we do it. Running the clubs also offers fantastic leadership training for our youth. We have weeklong summer camps that focus on service leadership. We provide mentors. Our camp delegates (student attendees) and the kids we train during the school year start community service clubs in their high schools, run projects in their neighborhoods and take on other service leadership roles. Entrepreneurship is difficult and we want to support them in these endeavors. That’s why we have a network of volunteer mentors – like Josh and D’mani. But the reality is that the success comes from the teens themselves. And the important thing is to get started. Josh also runs Josh’s Yolka Project, a nonprofit that raises money for Russian orphanages. He has raised over $60,000 to provide resources to the orphanages. Check out other Inspirational teens and how they’re changing the world one service project at a time. Also read about Jack Andraka, another amazing kid — at 15, he developed a Cancer diagnostic test 10X more sensitive and 26,000X cheaper than current tests. Learn more about Spark the Wave.